World of Color is a very bright map built from all the colors present in the game. Requires MCPE 1.1 and newer to install the map where many new design blocks are added. You will be pleasantly surprised when you see the beauty of the buildings. 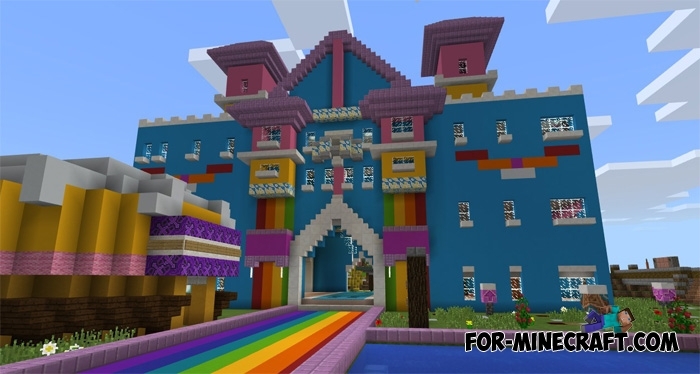 The map refers to the recent Minecraft 1.2 update which is aimed at the diversity and updating of colors in order not to limit the ability of players to build unusual structures. During the exploration of the map you will visit colorful buildings, balloons, decorated trees and much more. For skillful builders, there is a lot of free space.